Adam and Eve were Naked. Can You Prove this also Means they has a Clear Mind? Let’s confirm that a ‘clear mind’ is a deeper meaning of ‘aram’ or ‘arm’ (Strong’s 6175) translated ‘naked’ in Genesis 2.25. Does this mental state of ‘prudence’ correspond to their physical state of nakedness? Only the Biblical Hebrew can tell us if this is the case. Possessing a clear mind. That was the mental state of Adam and Eve. 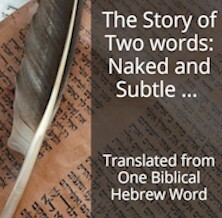 This is a profounder meaning of them being naked … as the Biblical Hebrew reveals. The above is the description of a positive clear mind. Notice that the subtilty in verse 4 is a positive quality to possess. While we’re in Proverbs 1, notice the context surrounding the beginning of this book, right after mentioning the constructive type of discernment: constructive ‘ARM’. Apply the principle here in Proverbs to our play. This is the subtext. Through his actions and dialogue, God is saying to Adam and Eve: Be prudent, don’t be fools. Or as a parent might say, ‘I’m telling you this for your own good. I’m giving you a clean start. I want only the best for you, I want you to be WITH me, and all these rules, this wisdom and instruction, will make that possible’. A smart start, in other words. At the very outset of the relationship between God and the first couple, it is this ‘wisdom and instruction’ that God shared with Adam and Eve on the Sabbath. The discernment and fresh clear mind can be attributed to that wisdom. Adam and Eve weren’t confused because they only had God’s understanding in the beginning. What we’ve just done is what I call ‘corroborating Biblewide contexts.’ Evidence that we’ve got the pieces of the Bible puzzle in their justifiable places. They fit. When you have the master pieces firmly in mind, these corroborating Biblewide contexts will jump out at you while you study, so that your Bible reading takes on an overall encompassing view, not simply a nitpicking, verse by verse, piecemeal approach. The principal point of Proverbs 1 intermeshes with Genesis 1 and 2; we can know what God was doing with His human creation on that first Sabbath day. The rest of Origin of the Universe, including all the exposition of words and principles in the Bible, relies solely on the tenets laid out in the preceding few paragraphs. We don’t need any extraneous works. I’m not saying that it isn’t interesting and fine to read and listen to other views, it is. Often, paying heed to different points of view triggers thoughts and ideas one hasn’t considered—but they must fit in the overall framework of the puzzle. If they don’t, they’re discarded. After all, Adam and Eve having a clear mind didn’t result from debating contradictory doctrines or computer analytics of biblical vocabulary to try to figure out who wrote what book. It came solely from God. And they were both naked, the man and his wife, and were not ashamed (Strong’s H954). KJV – (be, make, bring to, cause, put to, with, a-) shamed(-d), be (put to) confounded(-fusion), become dry, delay, be long. We focus on the various alternate translation of buwsh . Not only is it shamed but confounded or confusion. Adam and Eve had God’s wisdom and were ‘not ashamed’–not confounded or not in confusion. This makes sound contextual sense—and adds a totally new dimension to this verse. Can we corroborate this comprehension Biblewide? Let’s look at a few of the verses where we find this same Strong’s 954 Hebrew root. Psalm 22:5 They cried to you, and were delivered: they trusted in you, and were not confounded (954). Psalm 35:4 Let them be confounded (954) and put to shame that seek after my soul: let them be turned back and brought to confusion that devise my hurt. Psalm 71:1 In you, O LORD, do I put my trust: let me never be put to confusion (954). 13 Let them be confounded (954) and consumed that are adversaries to my soul; let them be covered with reproach and dishonour that seek my hurt. 24 My tongue also shall talk of your righteousness all the day long: for they are confounded (954), for they are brought to shame, that seek my hurt. Adam and Eve, who remain onstage in their original state, are 100 percent natural on the physical level (naked) identical to their spiritual level (prudence – clear mind). They have the discernment and are not confounded. Each clear mind is not muddled. They don’t even know what ‘muddled’ is. Galacti is in a state of astonishment. ‘Wow, I’ve read these verses in Genesis umpteen times and never ever realized this comprehension was there. And the amazing thing is that since Adam and Eve were with God in His Garden, it’s only logical that they were filled with His knowledge and each had a clear mind with no bafflement. The Hebrew meanings of arom and buwsh corroborate their actual state, and their state corroborates the Hebrew. It’s not a tautology, it’s essential information which Sam will come back to because there’s even more to this verse. There’s no forcing or twisting, the pieces fit—and to think we’re only at the beginning of the story. I’ll bet there’s going to be a lot of other such comprehension. Even if this is a fairytale, it’s enlightening’. This blog post is an excerpt from chapter 5.7 of Origin of the Universe the upcoming third book in ‘the Explanation’ series. Look at this verse in Strong: Psalm 71:24 My tongue also shall talk of your righteousness all the day long: for they are confounded (954), for they are brought to shame, that seek my hurt. Notice …brought to ‘shame’… This is the same English word at Gen. 2.25 but it is a totally different Hebrew root / word. I point this out so you can see what we’re dealing with here. Notice the KJV translations in Strong for this ‘shame’ (2659), they include similar words to 954 like confusion and confounded. Hebrew does have synonyms, different words with the same meaning. But, in some cases, as we see with ‘aram’ the Author is very specific in his choice of vocabulary. There’s a reason for this. Since you read all the way to here… you liked it. Please use the Social Network links just below to share this excerpt of Inventory of the Universe, Adam and Eve were Naked. Can You Prove this also Means they had a Clear Mind?